Hello again, and welcome to our third edition of “Interior Design Styles Explained”! Hopefully, you’ve been following along on our journey in which we’ve looked at both Industrial Design (available here) and Modern Design (available here) styles. Today we’re going to delve into the comfortable and classical style of Traditional Design. Soft, calming, and somewhat nostalgic, this aesthetic will have you pining for a good book to read in front of your lavish fireplace. Taking a page from 18th and 19th century European décor, traditional design focuses on the timeless style that fuses sophistication with comfort. Traditional interior design is all about creating harmony and order in your living space. This style makes use of captivating focal pieces like large classical art to draw the eye and rich wood tones, known for creating a warm homey effect in the home. With careful placement of antiques and big inviting furniture (such as tufted armchairs), it is easy to see why people crave the welcoming charm of traditional Interior Design. 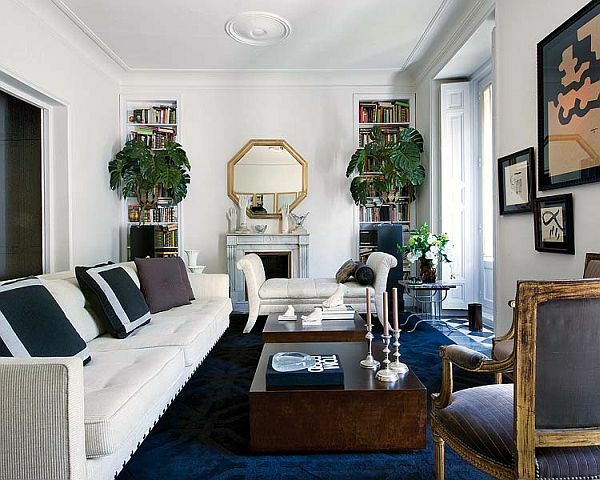 Unlike the styles we have previously explored, these spaces are all about being predictable … which is not a bad thing! These spaces are calm and orderly with no chaotic or wild pieces to challenge the flow. In a traditional living space, all the furnishings are consistent and cohesive. Unlike Industrial Design, the Traditional Style is no place to showcase a jarring modern art piece or any chrome steel furniture. Think soft angles and curves with decorative pillows that radiate a cozy “sink-right-in” feeling. Traditional Design is known for its neutral wall tones, which are used to help highlight the pieces within the space. These pieces are often ornate and luxurious with dark wood accents and bold, rich-coloured fabrics. Florals, paisleys, damasks, plaids, and stripes are key for the accoutrements. Be sure to pay attention to window dressings too; these additions are a great way to bring the traditional space together and can reflect the elegance of your furniture choices. These panels are made of heavy fabrics with rich, deep colours to offset the neutral wall colours. Finish off these treatments with elaborate finials and ruffled valances to mimic the grandeur of the room’s decor. Symmetry is the “be all to end all” when it comes to traditional interior design style! Almost everything in these spaces comes in pairs, including sofas, chairs, end tables, sconces, and accessories. This ensures that nothing is out of place or of a different style, and maintains that comfortable, calm feeling. This pairing is also used to create a balanced space around a significant focal point – such as a fireplace, TV or classical piece of art. Stay tuned for the next edition to learn more about our other favourite interior design styles. If you would like to learn more about how you can achieve this look, or more about Marlin Spring, please visit us here.